We’re taking our show on the road to New Brunswick for the very first time! 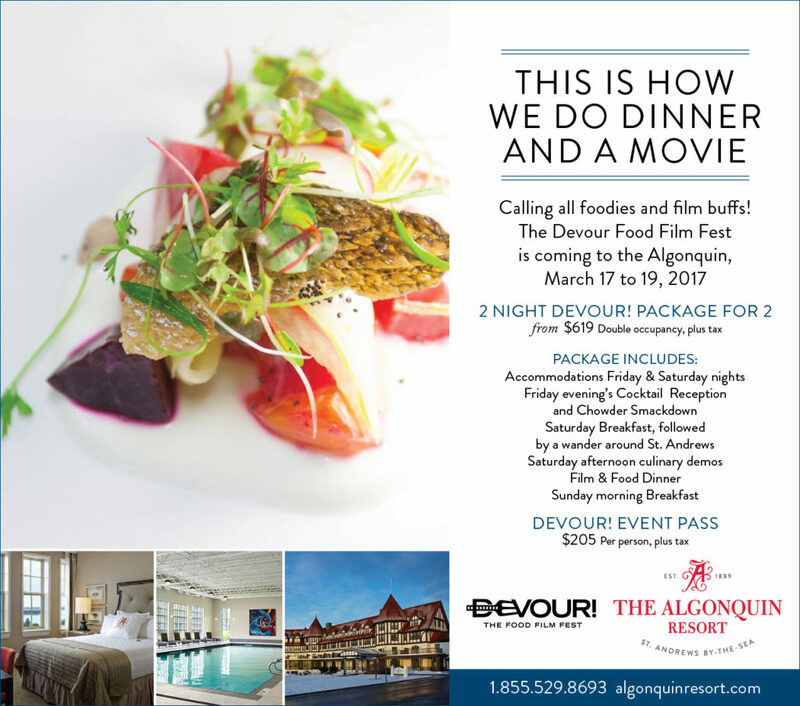 Join us at the iconic Algonquin Resort in beautiful St. Andrews by-the-Sea for a Devour! Film & Food Weekend from March 17-19, 2017. St. Patrick’s Day, anyone? Cocktail Reception on St. Patrick’s Day! Featuring six short films inspiring a six-course regionally sourced dinner prepared by Chef Michael Howell, Chef Ron Kneabone, Chef Alex Haun, Chef Jesse Vergen and Maxime Daigle. Full menu coming soon! See below for a more detailed weekend schedule. Get to know your fellow guests and celebrate St. Patrick’s Day while sampling products from Devour! partner, Mer et Soleil. Mixologist Rob Daigle and the Algonquin team will demo cocktail preparation and serve drinks while a continuous loop of fun cocktail films is being screened and small bites are served. 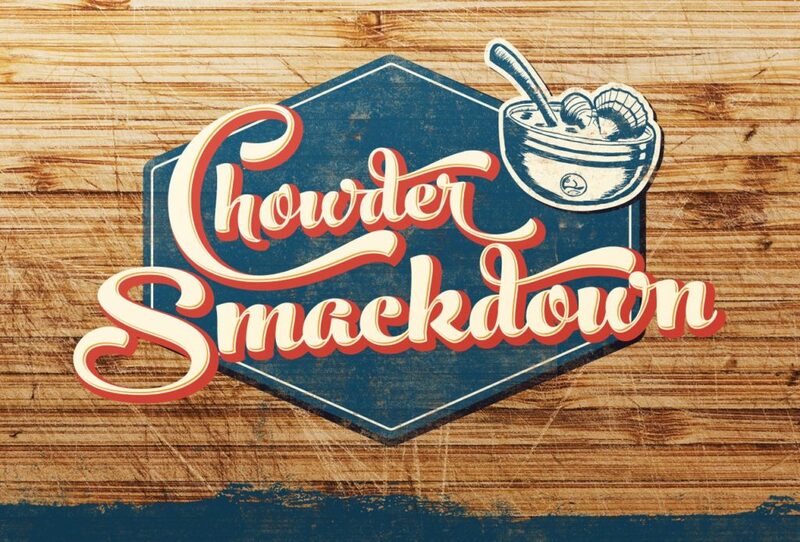 Sample two delicious and distinctively different chowders with all the fixings from your two competing host chefs for the weekend. Start your day off right with the wonderful breakfast selection and then head out and explore St. Andrews by-the-sea and everything it has to offer. During this entertaining and informative workshop you will be introduced to STURGEON, the royal fish that over the centuries was cherished, forgotten, overfished, misunderstood and at many times only known for its caviar. While many still believe sturgeon is a by-product of caviar production, we have long advocated for both nose-to-tail cuisine and respect of this majestic fish. During this workshop, we will talk about all the sturgeon products and benefits, we’ll cook and taste some simple dishes and share some of our sturgeon love with you. A newly lunched Sturgeon Technical Manual (second edition) will also be distributed to participants! Cornel Ceapa has dedicated the greater part of his life to studying and working with sturgeon. He is a scientist with a PhD in sturgeon biology. 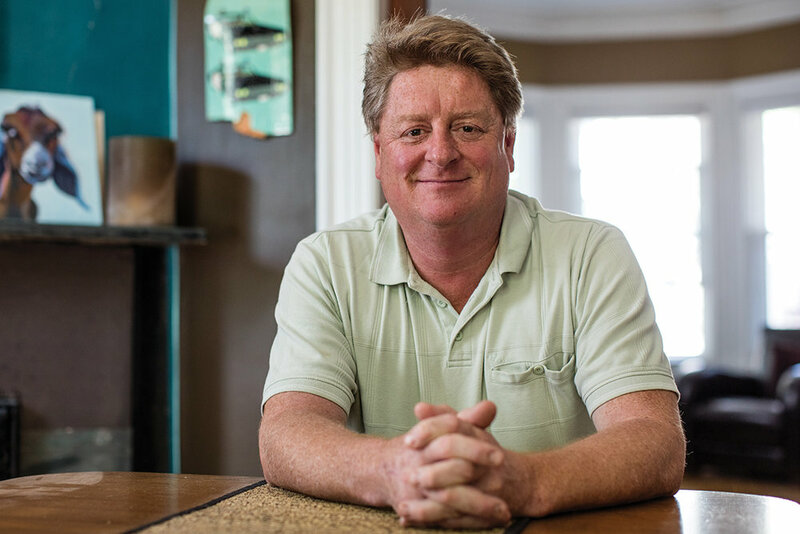 He is a conservationist, a researcher, a fisherman, a businessman, a roving salesman and an unadulterated sturgeon geek who can spend hours talking about sturgeon migration, sturgeon anatomy, sturgeon fishing, sturgeon recipes, sturgeon everything. Acadian Sturgeon was founded in 2005 and is truly a family business. Cornel works closely with his wife Dorina and son Michael to manage all aspects of the business – from caring for the fish; harvesting, salting and mixing the eggs; smoking and packaging the sturgeon meat; and managing the daily operations. 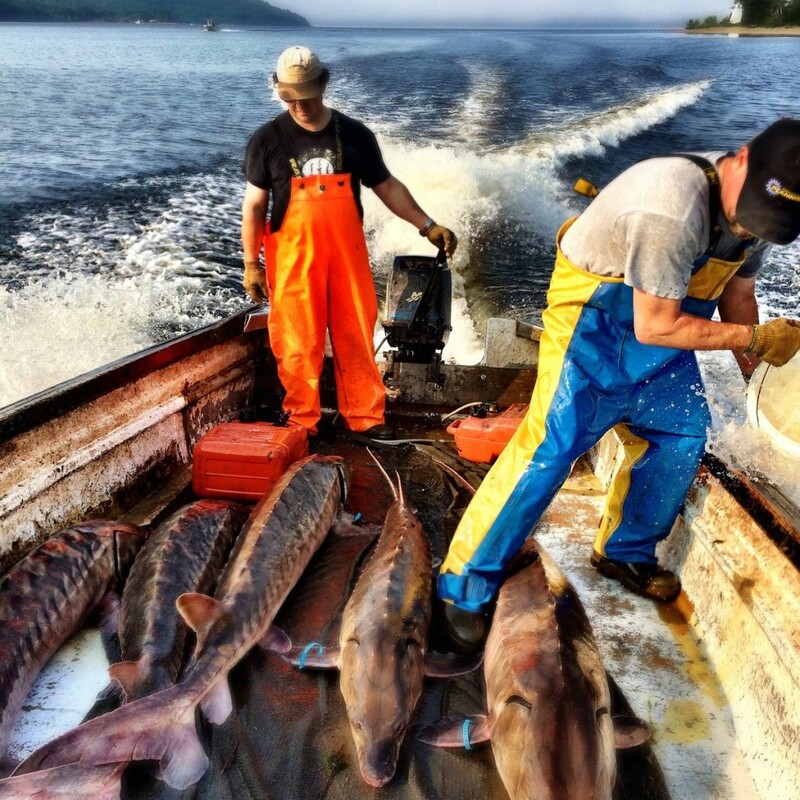 Cornel and his family work hard, loving what they do and taking pride that they are able to build a very difficult, sustainable business using their knowledge and passion for sturgeon, as well as the support of the people around them. Join us for a feast on screen and on your plate featuring six short films inspiring dishes from multiple chefs from the region for a six-course, regionally-sourced dinner paired with wines. Beverage pairings available at an additional charge of $30. Maxime is a 3rd generation oyster farmer; he grew up working on one of the first floating-tray oyster farms in Atlantic Canada. He now works for Maison Beausoleil led by industry pioneer and father Maurice Daigle, who along with business partner Amédée Savoie developped the brand and marketing of cocktail-sized oyster on the world market. 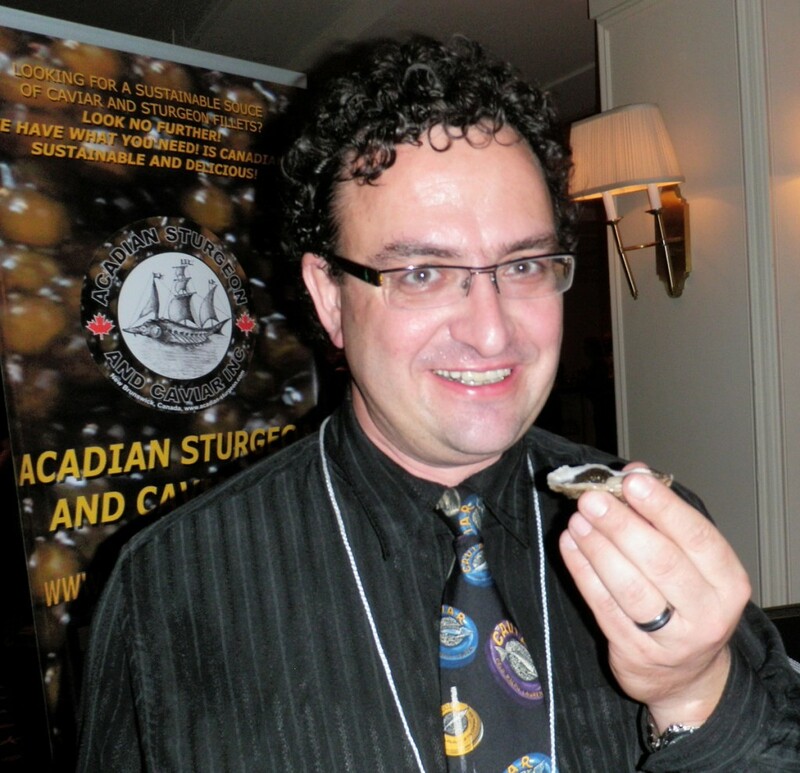 Maxime has occupied many roles on the farm over the years and contributes to getting oyster aquaculture better understood via his social media accounts (@maxbeausoleil) and public speaking. 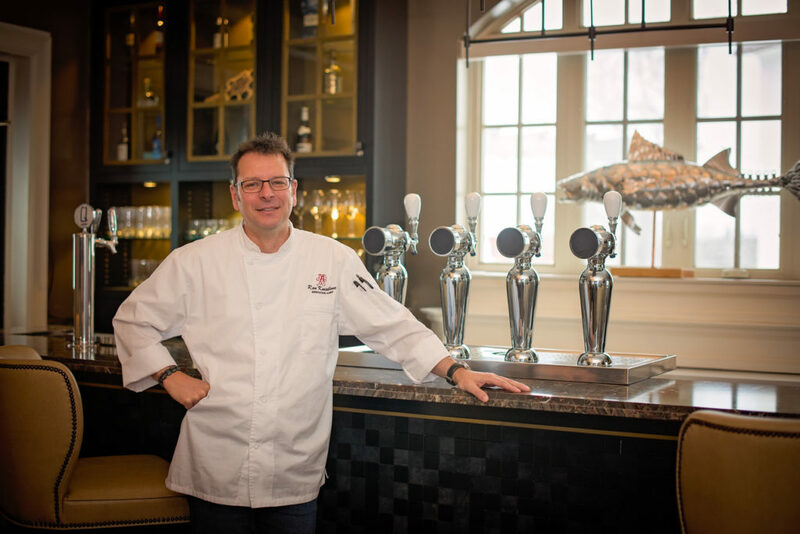 Ron Kneabone is the executive chef at the legendary, St. Andrews by-the-Sea resort. Most recently, Kneabone was the executive chef/food and beverage director of the Marriott Fallsview in Niagara Falls. Kneabone is a Culinary Institute of Canada graduate who apprenticed at the Calgary Olympics and spent 10 years in France perfecting his craft in Michelin three-star restaurants and farm to table operations in Alsace before returning to Canada. He is a Taste of Canada gold and silver medal winner. The Algonquin Resort, is ranked among Canada’s Top 10 hotels by Conde Nast Traveler, and has been awarded CAA’s prestigious Four-Diamond designation, overlooking the picturesque Passamaquoddy Bay from St. Andrews-by-the Sea, New Brunswick, Canada. 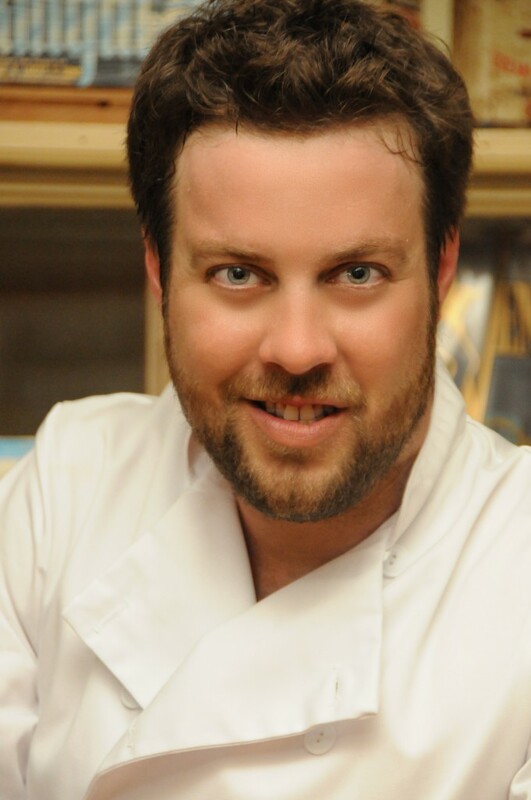 Chef Alex Haun is from St. Andrews New Brunswick, a small seaside community in southwestern New Brunswick. Alex had started his culinary career by the age of 13, working at the Garden Café located at Kingsbrae Garden in his hometown, Saint Andrews New Brunswick. He spent 5 years there while finishing his public schooling. 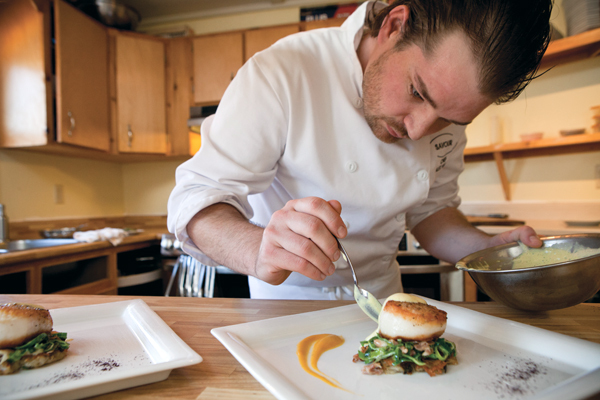 Following his dreams of becoming a chef, Alex enrolled in the 2 year culinary arts program at the Culinary Institute of Canada in Prince Edward Island. This lead to an apprentice position at the Relais & Châteaux Kingsbrae Arms. During this time Chef Alex started competition cooking, individually and as a member of Team PEI, where he was later nominated as Team Captain. After graduating from the Pastry Program, he became Sous Chef at Stanhope Bay and Beach Resort, part of the Murphy Group of Restaurants, where he eventually became a Corporate Pastry Chef. Chef Alex has 12 culinary Gold medals to his name and 5 of them are international wins. Moving back home to St. Andrews, the talented young Chef Alex opened his first restaurant, Savour, in 2009, at the age of 22. In 2013, Chef Alex was presented a unique opportunity to return to his roots at Kingsbrae Garden as the Executive Chef. He operates the Garden Café and created a new restaurant, Savour in the Garden. 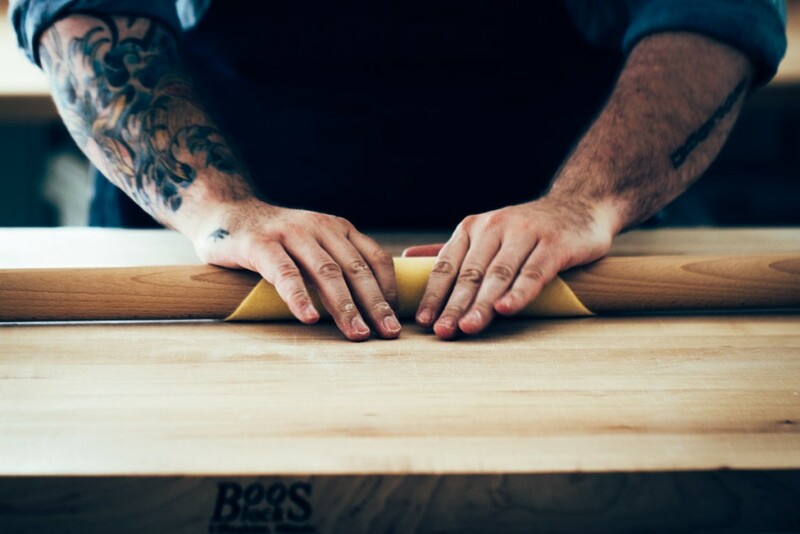 Hailing from New Brunswick, Jesse Vergen is a passionate chef that has made his mark by utilizing his province’s untapped bounty of small farms and fisherman as a base for his craft. Raised on a small organic farm in Fundy Hills, Jesse now resides on his family farm with his wife and three kids. 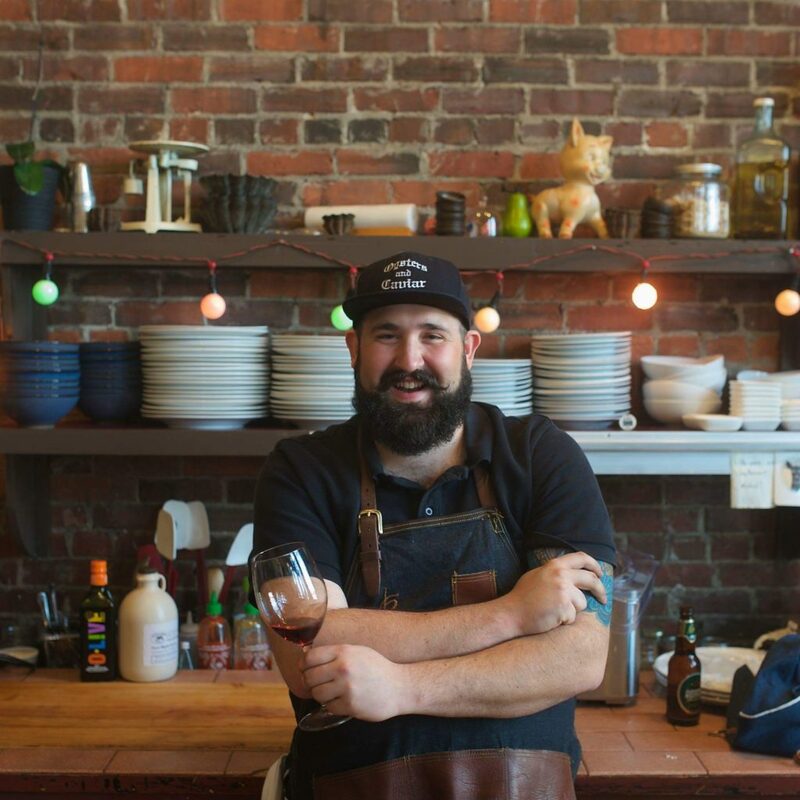 Produce from his farm is readily consumed by the hungry diners of the Saint John Ale House (ranked #39 on Vacay.ca’s Top 50 Restaurants in Canada list), Smoking Pig BBQ and Cleaver Catering, where Jesse has brought local flavours together with unpretentious dining. Jesse’s life is all about food – whether he’s in his kitchens, on his tractor, or hunting coastal marshes – flavour is always on his mind. A competitor on the fourth season of Food Network’s Top Chef Canada, his restaurant has also been featured twice on the network’s award-winning show, You Gotta Eat Here! Featured in many newspapers and magazines such as The Globe and Mail, Maclean’s Readers Digest, Chatelaine and EnRoute, Jesse was also one of the contributing chefs in Michael Smith’s documentary, Village Feast. Michael Howell is the founder and Executive Director of Devour! The Food Film Fest in Nova Scotia, Canada. For more than 25 years Michael has been a leading chef across the United States, Canada and The Bahamas. Michael hosts food and wine inspired travel to Italy, and is currently the consulting Executive Chef at The Green Turtle Club and Marina in Abaco, Bahamas. His chef career has seen him at Everest in Chicago (Mobil 5 Diamond award), where he recently returned as an honorary alumni cooking at the 30th Anniversary. After chef positions in Detroit, Boston and the Bahamas, Michael owned and operated Tempest, an award winning restaurant in Canada. Michael has twice cooked at New Yorks Prestigious James Beard House as guest chef. Deeply committed to Slow Food (he is the former co-Chair of Slow Food Canada) and global food literacy, Michael was named a winner of the Queen Elizabeth II Diamond Jubilee Medal in 2011 for his contributions to improving the food system for all. He was Nova Scotia Local Food Hero in 2010, and named Taste of Nova Scotia’s Culinary Ambassador (along with business partner Lia Rinaldo) in 2015. A wrap-up of our festive weekend over breakfast with Devour! organizers Michael Howell & Lia Rinaldo and featuring a screening of the award-winning short film Rated directed by John Fortson.